Highlighted in red are my two iSCSI NICs, clearly something is not balanced here as I should see an even distribution across these two NICs if MPIO is set up properly. Below is what my param.txt file looks like. This is a 50GB file so be careful! 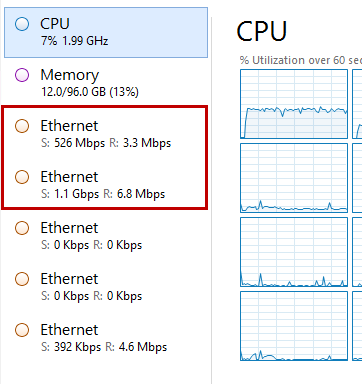 – In my case E: is a dedicated 250GB VHDx for SQLIO testing purposes which sits right in my cluster shared volume. Note: There are many more options, this is just what I selected to use. Read the readme.txt file! Note: The first time you run the above command it is going to create d:testfile.dat, this is going to take a really long time depending on your system as its creating a large flat file 50GB in size. – Once this is created every time yo use SQLIO with the same parameters it will use the existing file. Obviously my environment does not apply to everyone, in my case I have two iSCSI NICs and two iSCSI endpoints on my SAN. 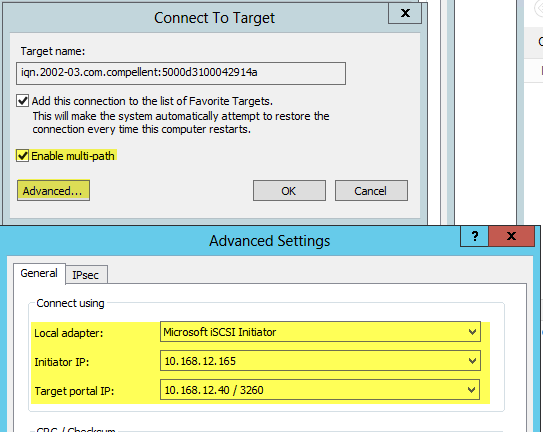 I would like each NIC to see each iSCSI endpoint (single fault domain – 1 VLAN) and utilize all paths evenly. Take into consideration what your actual environment looks like, I am just walking you through my testing scenario. 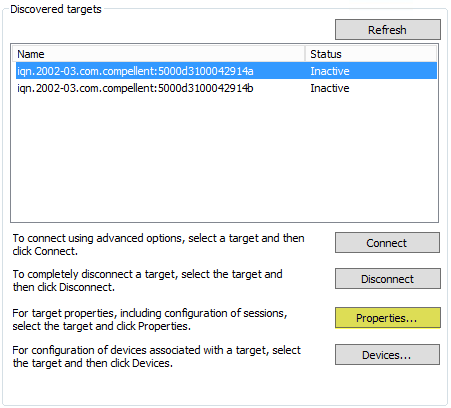 Run a quick connect to your targets discovery interface (I am testing on Compellent so I have a control port which will respond with all the available paths) – Don’t click connect! – Click Done instead!